This eye-appealing sweet is sure to appeal to your taste buds. Just relish its sweet and fresh rose flavour without worrying about gaining those extra kilos, as it's not only low in calories and fat but also rich in nutrients like protein and calcium.I liked this sweet for its simplicity of preparation especially no cooking and the promised elegance of taste. 2. Divide this mixture into 2 equal portions. Add red colour to one portion and mix well. Keep aside. 3. Spread the white mixture on a greased thali and keep aside. 4. Spread the remaining pink colored mixture over the white coloured mixture. 5. Refrigerate for at least 1 hour and just before serving cut into pieces. Wonderful and a colourful display of Burfi. Happy Diwali to you and loved ones. 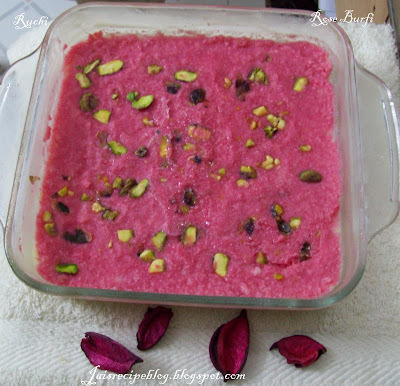 Yummyilicious Burfi..looks awesome..DIwali wishes to you and ur family Akka..
Wow.. love the pink burfi jaishree.. Am following you..! Do visit my blog..! colourful and amazing recipe! !sounds yummy 2..Happy diwali to u & ur happy!! wooo this is sooo beautiful and colourful..therez a small gift for u..plzz receive it.. It must have tasted heavenly! Simply superb a nd no cooking great idea yaar looks great and i like rose flavour in some sweets yumm. 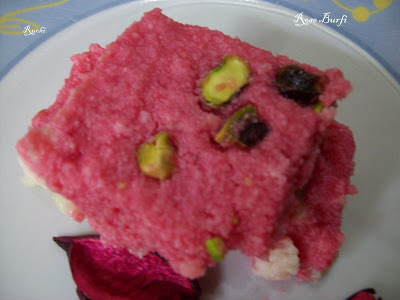 burfi looks yum,..you can send it to various events,..and ya happy diwali,..
Lovley colour, looks and sounds yum!! Hi dear! how have you been? hope everything is going just fine. Happy Deepavali! Looks yummy, nice and colourful! A must try for me..
hope you had a wonderful diwali with your family! burfi looks delicious!